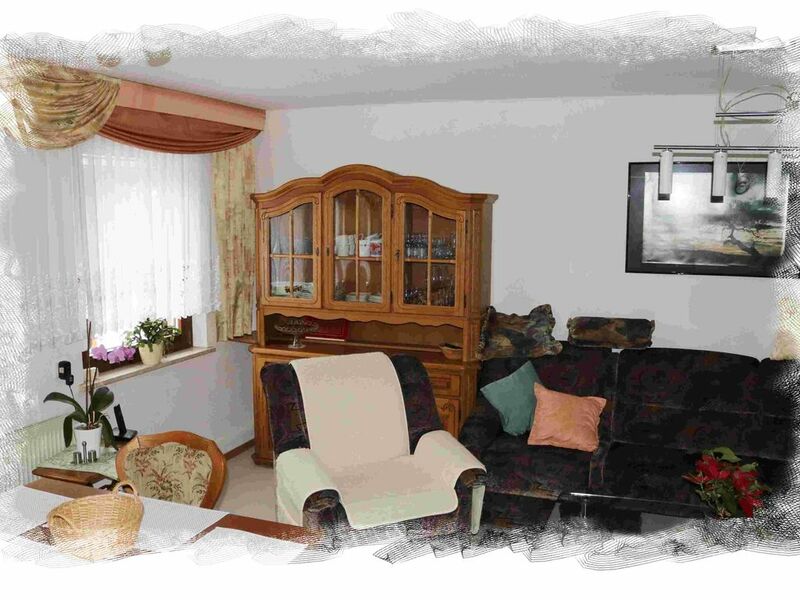 The apartment in Mitteldorf, in the Thuringian Rhön, corresponding to many demands of our guests. There are kitchen, bathroom, dining room, bedroom in very good facilities available. The size of the apartment is 43m² for max. 4 people. 1 bedroom with double bed and the possibility of extra bed in the living room for 2 persons. Furthermore, a LED TV, dishwasher, electric stove, telephone, Internet access, hair dryer, towels, safe, balcony with direct access to the garden (barbecue) and a separate car park. Sehr angenehmer Aufenthalt, kommen gern wieder! Obwohl extrem kurzfristig angefragt, hat alles prima geklappt. Sehr nette Gastgeber und die Wohnung ist auch in einem sehr gutem Zustand. Es hat uns sehr gefallen und gern kommen wir bei Bedarf noch einmal. In der kleinen Wohnung haben wir zu viert ein Wochenende verbracht und waren doch erstaunt, wieviel Platz wir hatten. Im Schlafzimmer steht ein großer Schrank- reichlich Platz für 4 Personen. Das Badezimmer ist neu und sehr gemütlich, die Küche ist besser ausgestattet als somanche im eigenen Zuhause und das Wohnzimmer ist mit Fernseher und einem Esstisch für 4 Personen für schöne Abende perfekt. Auch die Vermieter waren sehr nett und über die Gegend der Rhön braucht man nicht viel zu sagen - hier kann man sich tagelang beschäftigen. Wir haben unseren Aufenthalt sehr genossen und waren absolut zufrieden mit der Unterkunft. Alles war sehr sauber und die Wohnung war sehr gut ausgestattet, insbesondere in der Küche war neben den Standard Utensilien sehr viel vorhanden, was wir gar Bucht erwartet hättet. Absolut weiter zu empfehlen! Perfect house and so good received by the owners! Me and my wife had amazing moments there! The "Erlebniswelt Rhönwald" is an amusement park for young and old. Located in the middle of the biosphere reserve Rhön / Thuringia, a spacious playground and wooden huts with various themes on animals and plants offers great opportunities for discovery for children and adults. The highlight of this park is the "Arche Rhön" with an observation deck and the view to the Thuringian Forest as well as an interactive exhibition. A bat cave is also to be discovered. For the physical well-being of the "small whetstone". From here you can explore the 18.4 km long discovery trail "Rhön". Passing 21 stations you will hike along the most beautiful natural landscapes of the Thuringian Rhön with a view to the "Hessian Kegelspiel" or the Wasserkuppe.